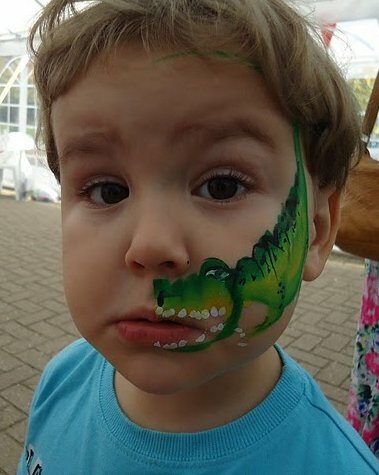 This past weekend Big Boy had his face painted by Little Stars Face Painting, at Harveys Furniture store and they did a fantastic job. Seriously they were so amazing, I shall put up the other work that they did on the rest of the family over the next couple of days as you will love it. Anyway, the picture that I thought would be fun for you to caption is below which was taken just after Big Boy had looked in the mirror to see his face with the addition of a dinosaur! Now last week there was a prize for the best caption of a photo taken of Daddy and I on our wedding day ten years ago so scroll down to see if you have won! Congratulations Clare (aka Emmy's Mummy) I'll be in touch to get your address details so we can send out your prize. I hope that you enjoy hugging Tatty Puppy as much as I will once I have stolen him back from Daddy!